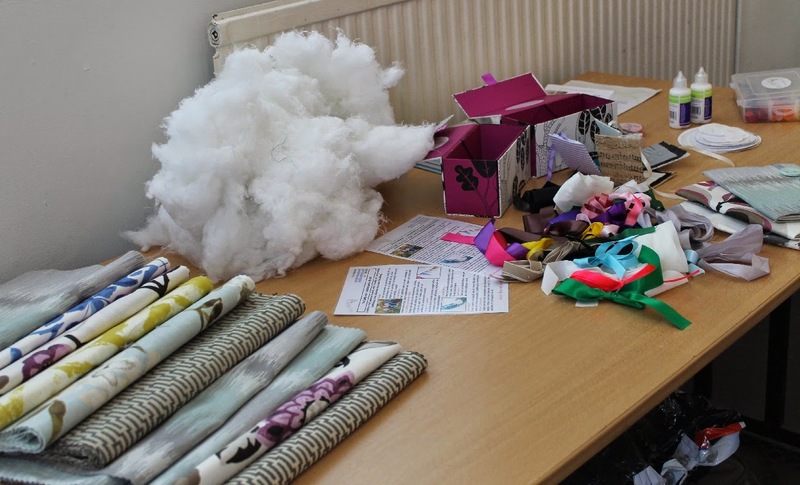 On Sunday I had a lovely “crafternoon” with some fellow bloggers and Hillarys Blinds. It’s very rare that I go off anywhere on my own at the weekend and I’m so grateful to my mum for taking Danny to Laserquest and Dave for staying home and baking with the girls whilst I attended this event. I do miss our Sunday outings together as a family, so it’s good to know they were having fun while I was too. I got to Cardiff really early, so I thought I’d “just pop” quickly into Ikea to pick up a junior chair for Izzy. I did try so hard, I headed straight for self service, avoided all the swish showrooms, scented candles and even lightbulbs (which I do actually need), but still I couldn’t escape the hordes of slow Sunday shoppers ahead of me, with all the free time in the World just to take in the marvel that is Ikea (I’d love to live closer and have time to do this too). Mission finally accomplished, I found Chapter Arts really easily using my new Sat Nav that Mum, Jo, Ceri and Lexy got me for Christmas (thank you!). The car park was full so I parked in the on street parking. Unfortunately it was residents parking only but my informant (you know the one that always stands by the residents parking to let people know not to park there) did tell me that it was ok to park in the “office staff only” part on Sundays so I moved my car to there and went in. Of course, now I was very late. Chapter is a very busy place with lots going on. I walked through the bar and cafe as a choir sang Calon Lan, which was heartwarming to hear on St David’s Day. At the front desk I apologised for my lateness and asked where I could find the Joes Bloggers Craft Event with Hillarys Blinds. The staff were very polite but couldn’t see anything under those names on their list so they asked for more information. I got out my e-mail and explained that there would be other bloggers there. Blank faces. They asked for a name of my contact and I said “James Brown”. Of course, they laughed and I realised I was beginning to sound a bit odd! I felt someone walking behind me, as I turned to face them I was relieved see that it wasn’t the Chapter Arts security but indeed the James Brown that I was looking for (not the dear departed Godfather of Soul). I instantly felt at ease and not so worried about walking into a room full of lots of other bloggers knowing that they are all going to turn and look at red faced me (eek), luckily I recognised lots of the faces so felt reassured. I spotted Georgina, Jo, Debbie and Chris . 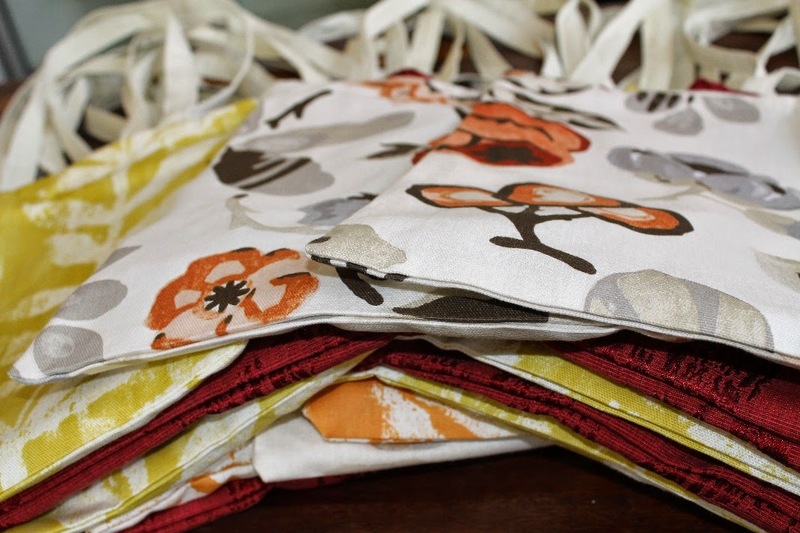 I just managed to catch the end of Julie from The Crafty Hen showing us how to make a fabric notebook cover. We were then all told to “choose our fabric”. I felt like I was on an episiode of “The Sewing Bee” as I waltzed up to gather my crafty bits. There was a spare space on Debbie’s table and I got to meet yet another friendly blogger, Katie. As I had missed the demo, I was pleased to see that the fabric book covers were simple to make and everyone was so helpful. We only had to sew the four corners of the book cover- if I had made this at home I would have over complicated things and sewn up every side so I learnt lots from this craft party. Despite the minimal sewing I still managed to prick my finger, bleed all over the beautiful fabric and then over the table (so sorry Katie and Debbie!). Thankfully Gemma came to the rescue with a tissue! However, from this accident, I did learn that the fabrics are all washable and easy to care for, which is always good to know. Our fabric notebook covers completed, it was time to make a 3D fabric bird. I have made hanging birds from two pieces of fabric, so it was interesting to extend on this and make them 3D. Again, they were fairly quick and simple to make but I want to make one again at home to improve on my rookie mistakes. My seam allowance was too narrow so I had some fraying and I need to make a more defined beak next time as looking over the photos on Instagram later I had “beak envy”! I would also have added a button or stitch eye if I had time. At the end we were given goody bags also made from the lovely Hillarys fabric. I really loved all the fresh designs and would love these throughout the house. It was a lovely Sunday #crafternoon with lots of chatter, laughter, creativity and biscuits (a perfect day!). I travelled home so happy and excited to show my family what I had made and tell them all about it. It has inspired me to hurry up and get a longer dining table, so me and the kids can sit and craft together more easily again. Unfortunately, with the yin and yang of life in full swing, I arrived home safely and then took a fall off the pavement (I wasn’t drunk, it was just very dark and I’m clumsy). I somehow managed to hit my head, right elbow, left knee and twist my back and ended up hobbling into the house sobbing. Dave had made lasagne, but I was in too much pain to eat that or the cakes they’d baked and even to drink the wine he poured. So it was ice, painkillers and bed for me. Dave bought the kids to school on Monday but I’ve been up and about since, albeit like an old lady who grabs her back whilst walking and winces everytime she slightly bends her knee. I’m taking part in a Danceathon on Sunday so I need to recover really quick firstly so I can manage the long train journey and then to actually dance! Any suggestions welcome as I’m still at the “getting worse before it gets better” stage at the moment! Thank you so much to the Joe Blogs Blogger Network for organising this event which Hillarys have also blogged about here.